Nothing ruins a trip faster than being pick pocketed, scammed or having a card number stolen. Take a few simple steps to keep your money safe when traveling. Here are a few tips on how to avoid becoming the victim of a scam and how to protect your wallet when vacationing in America and abroad. My in-laws are big travelers, and we have learned so much from their experiences. A great piece of advice they gave us was to split up our credit cards in case one of us gets pick pocketed or loses a wallet. Since Andrew and I got married, many of our accounts are shared. If one of us lost our wallet and were forced to cancel all the cards, we would be left away from home with no credit cards. A terrible situation to be in, especially if you are over seas. Each spouse or partner should have a card in their name only in case the above scenario were to happen. If you are traveling solo, don’t keep all of your cards in one spot. Carry one in your wallet, another in a closed pocket, and leave one in the hotel money safe. Don’t take every card you have. Clean out your wallet before you go and only carry the credit cards you’ll be using on your trip. If you have cards with foreign transaction fees, leave those home. Avoid using big denomination bills. I can’t tell you to have many times we have gotten screwed on vacation because we didn’t have small bills. It’s hard to count change fast when you’re not familiar with the currency and the cashiers who want to scam you know this. Familiarize yourself with the currency so you can just pull out what you need without displaying all the cash you have in your pocket. It’s never happened to us, but I’ve heard unscrupulous taxi drivers or street vendors will pretend to drop the large denomination bill you gave them and quickly swap it out for a smaller one insisting that’s what you handed over. Good luck sorting that out with a language barrier. You don’t want to carry too much cash either. If you are traveling and expect to use cash, never carry all of it in your wallet. Break it up and put it in different spots so if you do get pick-pocketed it won’t leave you broke. Keep some money in your wallet, some in a shoe or bra and leave the rest inside the hotel room safe if one is available. Never leave any valuables in your room unless they are locked up in a safe. Living in NYC, I can spot of those “Buddhist Monks” from a mile away. I’ve seen it happen to tourists many times. Before they know it, they have a gold beaded bracelet on their wrist and are being strong-armed into handing over $5 for good luck or some other crap being sold. Pickpockets are swarming around crowded tourist areas. Another common scam is the lost wallet. Someone plants a wallet on the ground as if it’s lost. When you see this, you immediately check to see if you have your wallet. Now the pickpocket knows exactly where your wallet is, making it easy for him to grab it later on. 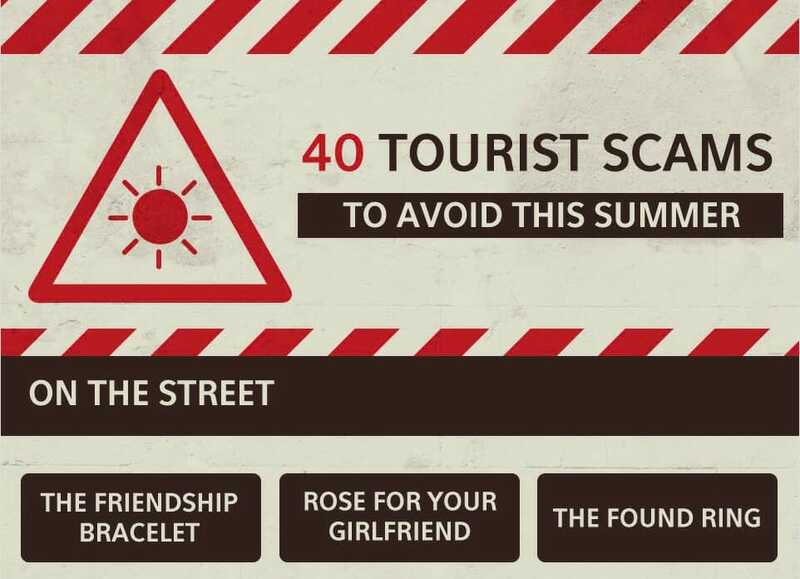 There are scams like this in every tourist area across the globe so know which ones you may be walking into on your next trip. Check out these 40 common travel scams you should be aware of before your next trip from Lifehack.org. Before booking excursions for our travels, I always look at a ton of reviews and make sure I’m getting the best deal and a safe, fun experience. Except for that one time I didn’t. The snorkeling tour we researched was booked for the day, so instead, we walked around and got sucked in by one of those street vendors selling tours. Since we were still kind of bummed our original plan didn’t work out, we were easily talked into signing up. We paid and walked over our “boat”. I will spare you all the details, but we spent two hours on a rickety boat with three teenagers who kept us out at sea while trying to get us to buy a CD with pictures of ourselves on it for $30. We refused, but it totally ruined our mood for the rest of the day. Do the same with restaurants, check reviews and menus before you go. When you’re hungry and walking around to find a place to eat, some friendly guy will pull you into his restaurant and serve you “the unusual catch of the day” and then charge you $400 for it. True story. There was also time we were charged a 30% service fee and then were also asked to leave a tip. Shall I go on? No one likes to feel like a sucker so just be aware and be smart. Try to use machines inside your hotel, the airport or a bank. Watch out for sketchy ATM’s and be sure the cash machine is legit before inserting your card. There are fake cash machines in tourist areas, and thieves will tamper with real ATMs to get your information. Visa and MasterCard have ATM locators on their sites so you can find trusted locations in the area you will be staying. We try our best not to look like tourists, but when you have Nikon D5200 hanging around your neck, you are a clear target. We usually only bring our cameras on excursions and to major sites. When we are walking around crowded streets at night after a few glasses of wine, we leave our fancy pants camera in the safe. We just use our cell phone camera. It’s one less thing to worry about, and it will draw less attention. Unfortunately, there are scammers everywhere you go, but don’t let it stop you from exploring the world. Not everyone is out to get you. Just stay aware and do some research before you go to understand the environment you’re going to be in. Don’t be scared just be prepared! Take some precautions so you can enjoy your travels. Find out how you can travel and see the world without breaking the bank.